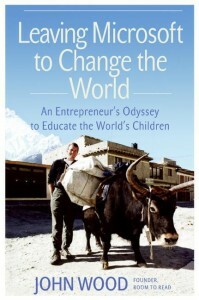 In 1998, John Wood was a rising executive at Microsoft when a trip to Nepal inspired him to change the world, one book and one child at a time. Fueled by the same drive that that made him a top executive, Wood married Microsoft business practices and the world of nonprofits to create Room to Read, a nonprofit that has created more than 2,000 schools and libraries throughout Asia and has donated more than one million books. In Leaving Microsoft to Change the World, Wood chronicles his life and work, from the start-up years at Microsoft to his life-changing decision to leave, and includes the methods he uses to manage Room To Read.